I was a tad cautious about this new acquisition by Dynamite after several other classic heroes (Lone Ranger, Green Hornet,etc), as there’s already a Flash Gordon series from publisher Ardden, and has been for a while. (In fact, you can read their #0 and #1 issues for free.) However, this debut issue (at only $1!) is awesomely rousing with a great focus on action and drama. Setting the story in 1934 (the year of the adventurer’s debut, courtesy of Alex Raymond) was a bold, but wise move. 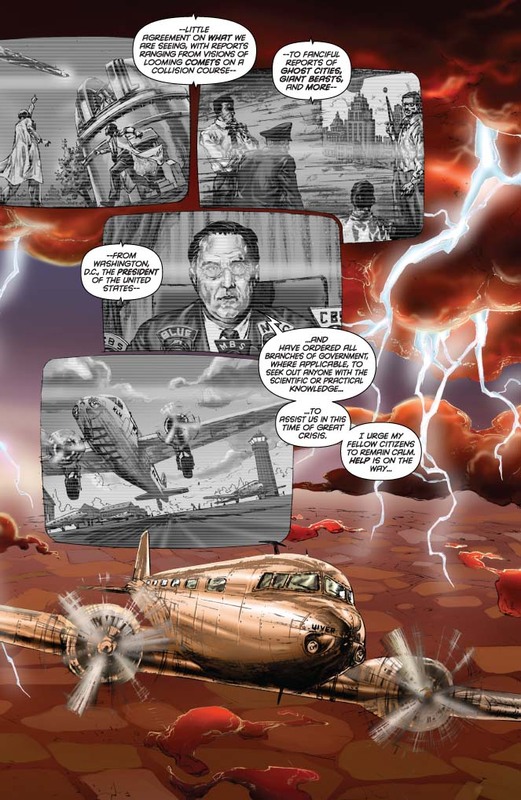 Not only does it set it apart from Ardden’s modernised take, it also gives Flash Gordon a unique flair for adventure, much like The Rocketeeer or Indiana Jones tales set roughly in the same era, do. We first see Flash when he’s jumping from a burning plane, with cartographer Dale Arden in his arms. Handy captions introduce us to all the main players and Flash is instantly likeable due to that charming ’30s style and the fact that he’s a polo player once more. Flash and Dale are on a mission to find reclusive scientist Hans Zarkov. They do and he’s wonderfully crazy (well, at least a little bit). Zarkov believes there’s a way from our universe to others, and that inhabitants of said outer worlds have been visiting Earth for recruitment purposes. One dangerous space shuttle journey later and Flash and Dale see his point. 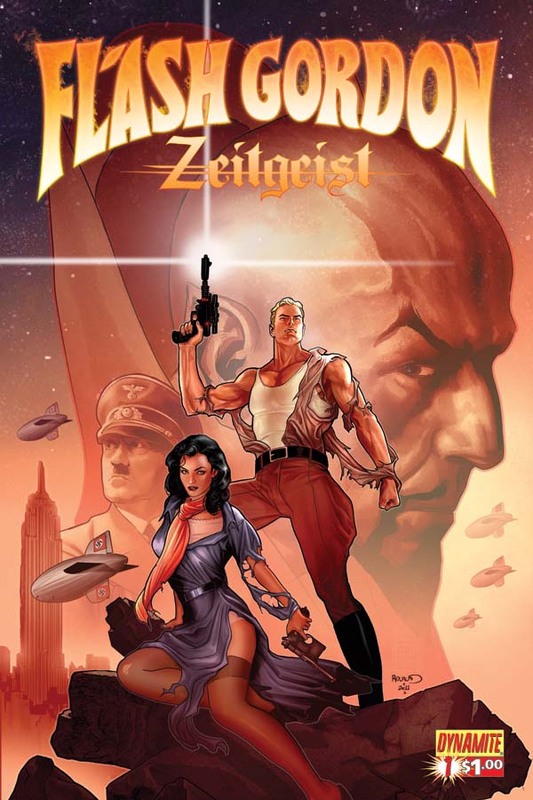 On the last few pages three rebellious Mongo citizens visit Germany to hunt down Ming ally, Hitler. This was a pleasant surprise, adding one more layer to this daring tale. Artist Alex Ross (Kingdom Come) has long been a fan of the character and an interview with him even shows up on the DVD of the 1980 film. 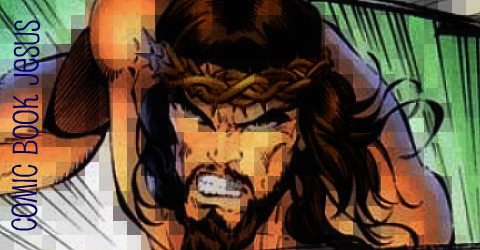 His love is evident here in his character designs and art direction, a role (as well as variant cover artist) that has kept him busy with numerous series over the last few years at Dynamite. 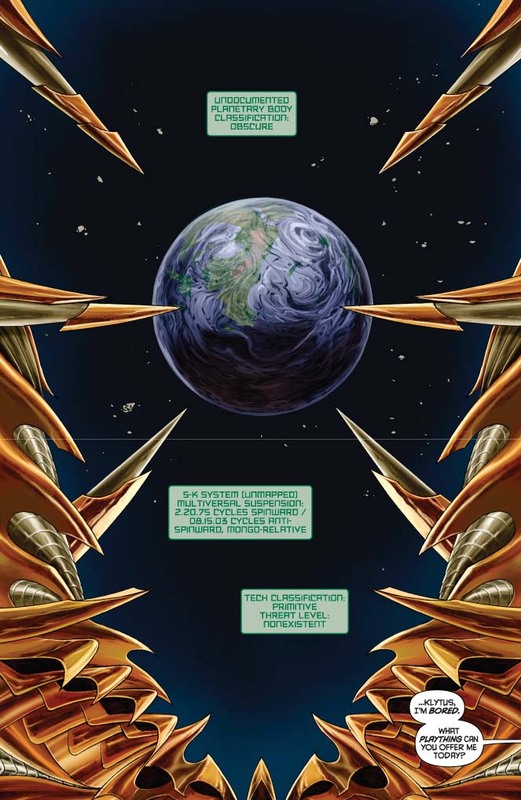 Not as outlandish as his designs for the Jack Kirby inspired titles, they evoke classic sci-fi trappings much like the rockets and alien thrones do. Throwing Ming’s snivelly right hand man Klytus from the film was a nice surprise too, and Ming really lives up to his Merciless title, with his disdain for pretty much everyone, including his slave girls and the entirety of the human race it would seem. More of a nuanced character and not at all a stereotype, Ming is like Darth Vader in Episode IV. We don’t see much of him, but we see enough to know that he’s a calculating despot. Daniel Indro’s art is a perfect fit. Similar to Ross’ pencils, but with a dynamism all his own, he skimps no detail. The script asks him to create aliens, Zarkov’s busy lab and high drama fuelled emotion, and he does it all splendidly. In particular, the escape in Zarkov’s experimental shuttle is a very well crafted sequence. I’m looking forward to seeing more of his work and it looks like we’ll be witnessing both Earth and Mongo scenes. Excellent. Writer Eric Trautman (who plots with Ross) does well to craft an entertaining story, with just as entertaining central characters, despite there being several of them. It’s a fast ride and there are no dull moments. From Flash’s take charge attitude, Dale’s far from damsel in distress attitude, and Zarkov’s crazed brilliance, he captures the essence of these well known characters in a superb fashion. 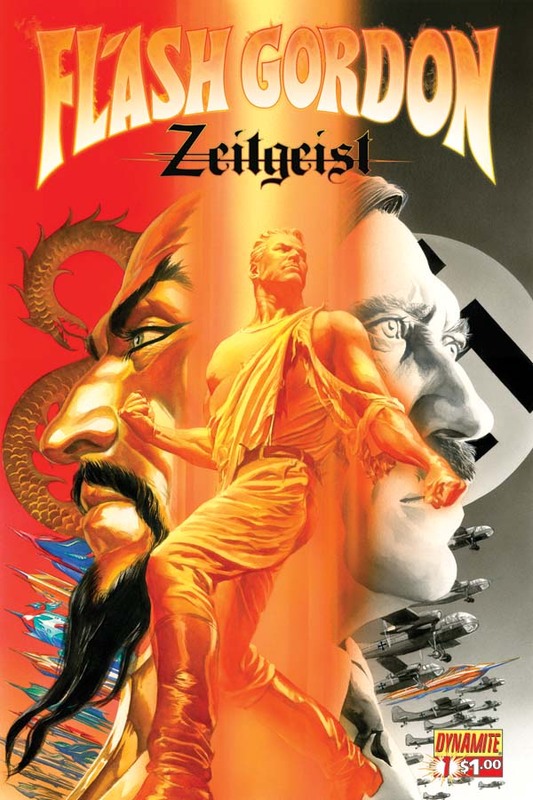 Hitler is no surprise, as he’s shown on the cover, and is hinted that he’s a Ming supporter. If done well, this concept could work, with a nice history/fantasy blend, though I’d imagine there may be some that would cringe with the very idea, but it’s too early to tell just yet. 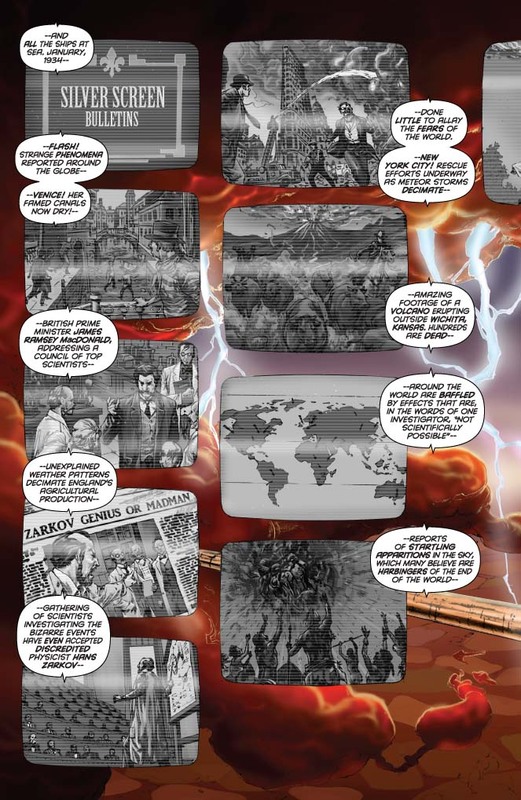 Those familiar with the awesomely cheesy 1980 film (with the great Queen theme song) will fondly recall the opening lines here and it’s obvious that the creators are well aware of Flash’s vast history. This is no duty old reboot that sits awkwardly with today’s superheroes. This is a new Flash Gordon. He’s almost the same as the old one, but better. He’s a hero for today, and he’s highly entertaining. I just picked this up yesterday, so I’m not reading your review for the moment, but after I’ve read the book and done my own review, I’d like to compare note! Hah, no worries Lew. Hopefully you’ll be impressed. Okay I did read this the other day. I have to do my review in a little while on Comics Eye, but this was great stuff! Flash, Zarkoff, Dale, Ming….and Hitler!? Glad you enjoyed it; we’re having a good time on the book. Thanks for the kind words. We’ve been publishing Flash Gordon comics since 2008 and have received rave reviews from Publishers Weekly, Ain’t It Cool News and more!